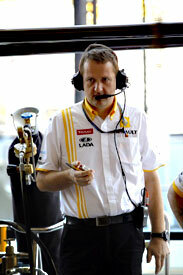 Renault sporting director Steve Nielsen is to leave the team as part of an internal restructure. Nielsen has been with the team for more than 10 years but tendered his resignation over the weekend of the Spanish Grand Prix when he discovered that John Wickham, formerly the technical and operations manager of A1GP, had been commissioned to conduct an efficiency study into the team. Wickham managed the Spirit-Honda Formula 2 team in the 1980s and brought the engine manufacturer into F1 in 1983 before Honda did its deal with Williams. He has not been in the F1 paddock for some time but had a good working relationship with Renault/Genii team principal Eric Boullier from A1 GP. Neilsen is under contract to the team until the end of the year and it is understood that he will continue to work with the team, likely as far as the Singapore GP. It is also expected that current engineering chief Alan Permane will perform a more senior role and that Wickham will also be part of the restructure, in a new role. Boullier said in Canada: "It's a principal of any competitor to always look at yourself. We are still looking at finishing the restructuring of the team to be better." Boullier also dismissed recent rumours of financial hardship at the team. "My understanding is very clear: there is no issue at all," he said. "But, as we say, there is no smoke without fire. So it's clear there was some stress, let's say, on a couple of processes to be done financially, just because it's always three or four parties getting together and if one of them fails that causes a mess in the loop. That is why there was this rumour. But there is no issue at all and you will not hear these rumours again." For more insight, see this week's Dodgy Business.